Blooming all summer long, through the hot days and strong sun, takes a tough shrub. The plants take the heat and still have the energy to produce a profusion of bright flowers all summer long. Plant these shrubs near patios, along a fence, as background plants or as specimen plants and watch the colors take over when the spring flowers are gone. Japanese hydrangea (Hydrangea serrata "Golden Sunlight") is hardy in USDA zones 6 to 9 and blooms in July and August with white flowers edged with pink growing in clusters. Golden-yellow egg-shaped leaves measure 6 inches long, turn dark green as they mature and finally a burgundy in the fall. The shrub grows from 2 to 4 feet tall and 2 to 4 feet wide. Plant Japanese hydrangea in partial shade and a moist, well-drained soil. Bigleaf hydrangea (Hydrangea macrophylla) measures 6 to 10 feet tall and about the same in width. Variegated, egg-shaped leaves grow from 4 to 8 inches long. White, pink, red or blue flowers bloom from spring through summer and give way to tiny, brown fruits. The plant is hardy in USDA zones 5B through 9A. Plant bigleaf hydrangea in full shade and moist to wet soil. China rose (Rosa "Mutabilis") is hardy in USDA zones 6 to 9. The plant grows from 3 to 6 feet tall and 2 to 5 feet wide with red stems and medium-green leaves. Flowers start out as yellow, changing to orange, pink and finally red, measure 3 inches in diameter and grow in clusters. The flowers bloom from May to first frost. 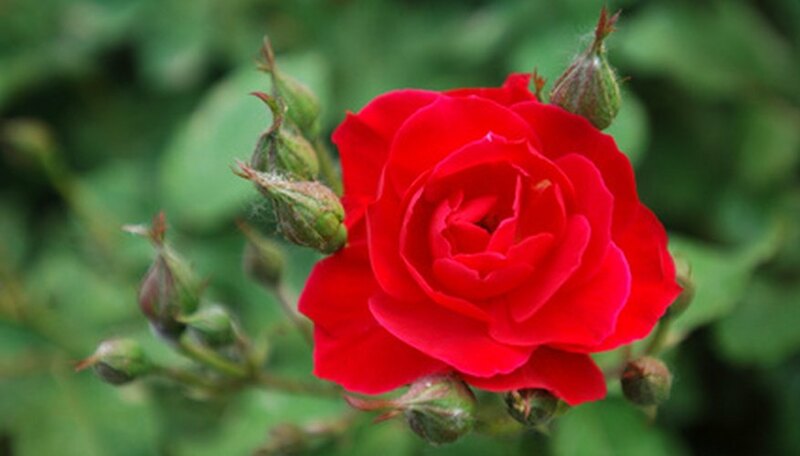 Plant China rose in full sun and a moist, well-drained soil. Abelia (Abelia "Edward Goucher") is a deciduous shrub that grows from 3 to 5 feet tall and 3 to 5 feet wide. Dark green, egg-shaped leaves measure 1 1/4-inches long and turn purple/bronze in the fall. Lavender-pink, funnel-shaped flowers grow in clusters from May through September. The plant is hardy in USDA zones 6 to 9. Abelia likes full sun or partial shade and a soil that is moist and well-drained. Flowering-maple (Abutilon x hybridum) is a broadleaf evergreen shrub hardy in USDA zones 9 to 10. The plant likes full sun or partial shade and a rich, moist, well-drained soil. The shrub grows from 8 to 10 feet tall and about the same in width. Red, pink, yellow or white bell- or cup-shaped flowers measure 3 inches in diameter, blooming from spring to first frost. Leaves, either solid light green or light green with white or yellow markings, resemble those of a maple tree.